Battle Girl awakens in a state of confusion as she discovers that she has somehow been transported from Earth to Glum World. She explores her new surroundings and comes across some a lake where she sees her reflection. Angel Murphy realizes that she has been dressed in the costume of her doppelganger Angel Dragon and has even been given the same haircut as her double. She guesses that she had been gassed in her sleep and taken from her apartment and into the strange Dimension-X. Back on Earth, Craig Gotsill stops by the apartment of the Dragon family and shows off the brand new Rob Liefeld brand Cable cybernetic arm. The replacement limb was necessary after Amy Dragon tore it off but with the super-strength he now possesses in this arm he can now hold the triplets safely. Unfortunately for Craig, Amy hurls an item at his head where there is no protection and he is rushed to hospital for treatment. 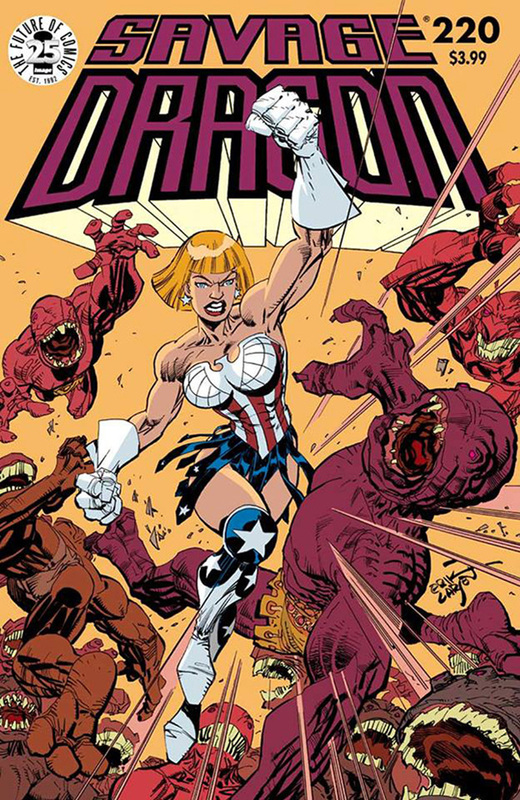 A pair of super-powered alien thugs attempt to assault Battle Girl but she is able to fend them off and send them fleeing for their lives. As she pursues she comes under fire as the alien vessels that had previously assaulted Toady return. Angel tries to make it clear that she is not the former consort of Mister Glum but the attack continues regardless. Just as it looks as though Angel may be overwhelmed, the aforementioned Glum bursts onto the scene and destroys the invaders. Dragon receives some good news when the prison guards inform him that he has received a full presidential pardon for any crimes he has been charged and convicted of committing. Malcolm Dragon arrives to drive his father home to his apartment where he gets to properly Maxine and the triplets. Dragon offers to help Maxine with the kids as Thunder-Head now has a new job and Angel seems to have vanished and has not been around to assist. Mister Glum acts as if Battle Girl is his deceased lover and ignores her attempts to point out quite forcefully that she is a very different person to Angel Dragon. She has zero interest in a relationship with the evil alien dictator and just wants to return home. In an effort to win Angel over, Glum takes her to his private sanctum where he had hoped to show her the long-thought dead Jennifer Murphy. With the revelation that Jennifer may still be alive, Angel reluctantly agrees to remain on Glum World so that she can help Glum locate her mother. Life in the outside world is a bit of a jarring experience for Dragon as the news that Donald Trump will become the next President of the United States has caused a number of issues around the nation, including Chicago. Both Dragon and Malcolm receive xenophobic abuse due to their alien genetic heritage. Malcolm and Maxine later go to bed together and discuss what Dragon is doing with his newfound freedom, assuming that he will be enjoying himself. They are unaware that Dragon is in fact just sitting alone in the dark in his new apartment.